Fireflies: Where Are They Now? Very few of the Australian Fireflies remain in one piece. Here are those that are known – please contact the Webmaster if you have any other advice. Below: WD827 was sold to the Australian Air League in Blacktown in early November 1956, who parked it at their premises in Kildare Road Blacktown (see photo left). 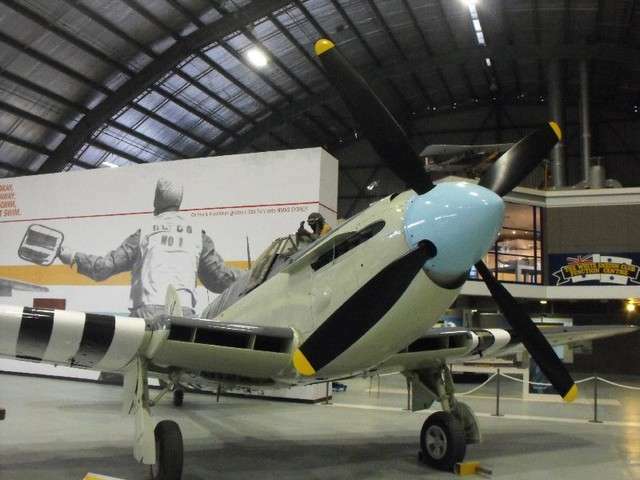 It was transferred to the Moorabbin Air Museum (now the Australian National Aviation Museum) in May of 1973, where it was gradually refurbished to non-flying display standard. It remains there until this day (Right photo Martin Edwards). Further details of the refurbishment have been requested and will be posted here if received. Left. A later shot of WD827 parked at Blacktown. It was acquired from the Australian Air League for a straight swop for a single seat Vampire, and was transported to Point Cooke until it was trucked to the Museum in Moorabbin, where a couple of volunteers replaced perspex in the front cockpit, cleaned up the airframe and gave it a paint job. At a later date another volunteer completely restored the pilot’s cockpit and the Observer’s station including new perspex over the latter. 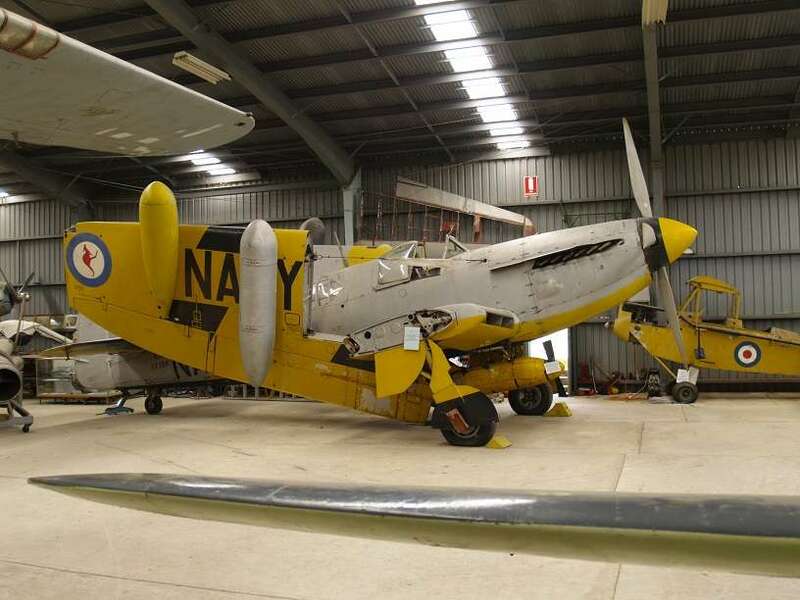 Incidentally, and on agreement, the serviceable radiators of WD827 were swapped for unserviceable units and taken to the Fleet Air Arm Museum at Nowra for attachment to a Firefly under restoration. 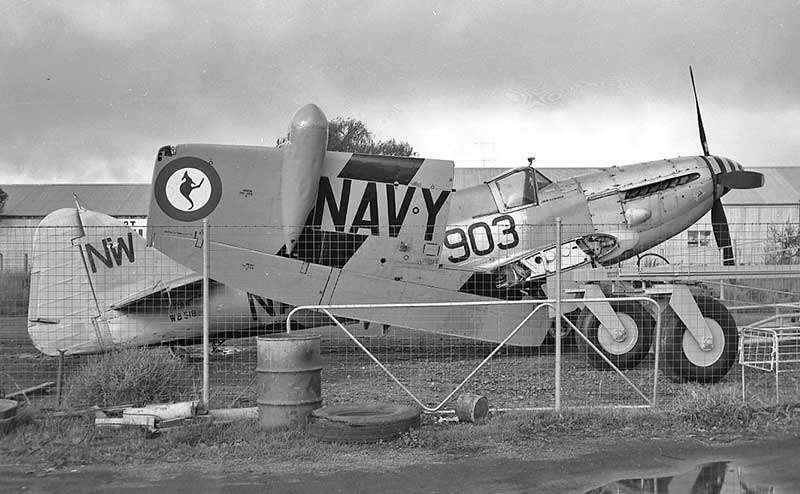 Below: WH632 arrived in Australia aboard HMAS Sydney in August 1953 and was placed in storage – perhaps as an attrition airframe that was never needed. In June of 1969 it was sold to the Marrickville Air League in NSW who held it in open storage in a compound. The Canadian Warplane Heritage Museum bought the aircraft, together with a large number of spares, in June of 1978. See the remarkable story of its restoration here. Below Left: Arriving in Halifax (photo Canadian Warplane Heritage Museum). Below Right. WH632 in flying condition. (Photo Kool Shots). Click on image to the left to read of the remarkable restoration of WH632. WJ109 (right) has been the FAA Museum static display aircraft since mid-1980‘s. 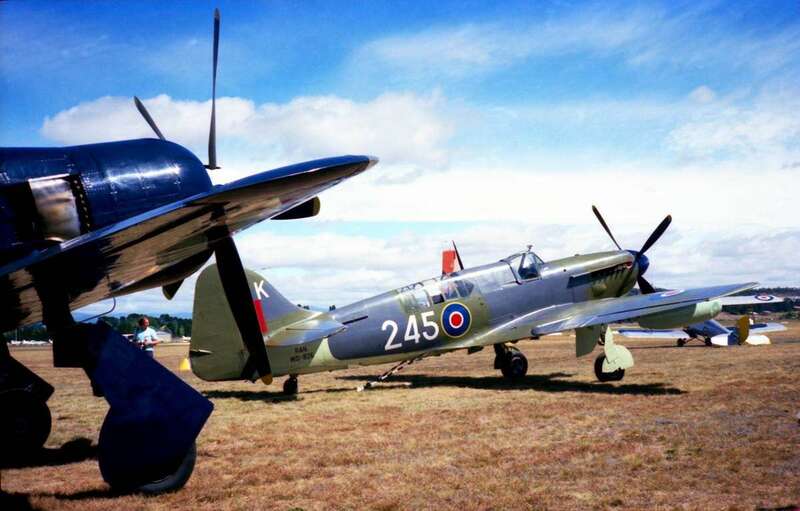 Previously was ALBATROSS Gate Guard alongside Sea Fury VW232, from circa 1967. WJ109 was complete with operational engine when removed from Gate Guard duties and used as the Christmas Tree for the airworthy restoration of WD826. At one stage (circa 1985) both aircraft were brought up to ground running and taxiing condition. Having shed a lot of components to support the rebuild of WD826, WJ109 finally lost its engine to WD826 in 1987 when the engine from the latter was destroyed on a ground starting incident involving a Coffman cartridge starter without the correct overpressure “blow-off’ disc. WJ109 spent many years parked in the open air and subject to weather during the construction phase of the AMOF hangar and deteriorated very badly. 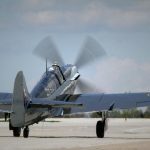 It was painted by British Aerospace as a favour in the early 1990‘s and another damaged engine block and propeller reduction gear was installed to enable fitment of the propeller. 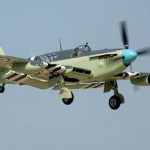 Although the colour scheme, which it still wears, represents a Korean War-era aircraft with Invasion Stripes, WJ109 was a Mark 6 converted to Target Tug, and it never saw Korean service. WJ109 is now allocated to go to the Australian War Memorial for permanent static display. At the time of publishing this (Jan19) it is in “J” hangar where it remains waiting collection by the AWM in May 2019. WD826 was transferred second-hand from the RN in 1953 and later (1958?) converted to Target Tug. 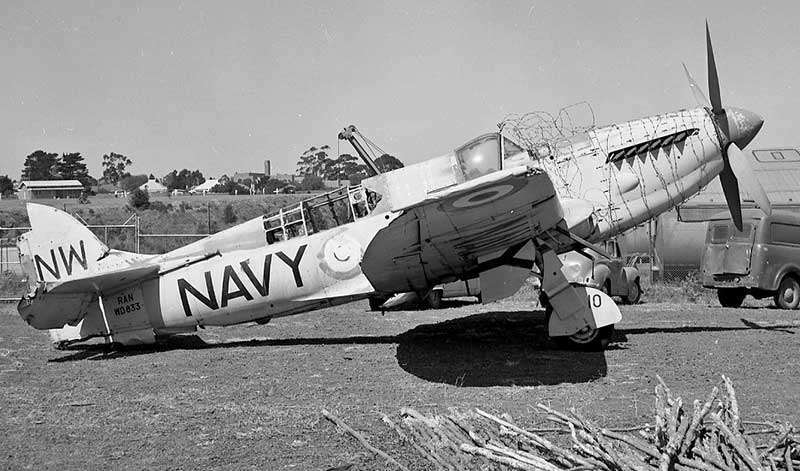 It operated at 723 Sqn and at Avalon, Victoria by contractors Brain and Brown to tow targets for the West Head Gunnery Range at HMAS CERBERUS. In 1966 it was flown to Bankstown for disposal but was then transferred to HMAS NIRIMBA as an apprentices training aid. In 1974 it was road transported back to ALBATROSS to form part of the “new” Fleet Air Arm Museum exhibits. Its engine was made serviceable and was fired-up at the instant that VADM Vat Smith declared the museum OPEN. With the formation of the RAN Historic Flight WD826 underwent a strip, inspection, rebuild and repaint to make it airworthy. It flew for less than three years, and last appeared at the Australian Bi-Centennial Airshow at RAAF Richmond in 1988. The engine that had been swapped into it from WJ109 developed major internal coolant leaks, causing operations to be curtailed. 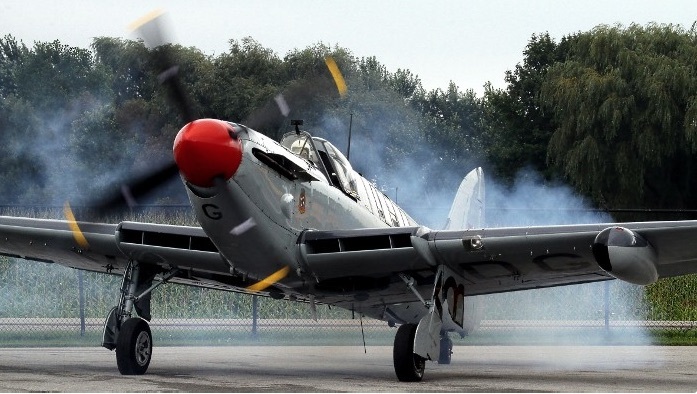 An engine rebuild and aircraft restoration was started in 1991, receiving various levels of funding and support over the intervening 25 years. The engine was sent to the USA for rebuild, major hydraulic components were overhauled, wiring was upgraded, the propeller was overhauled and major structural repairs were carried out on the airframe. It was repainted to represent the aircraft flown by the CO of 817 Squadron on the final deployment to HMAS SYDNEY in 1955-56. 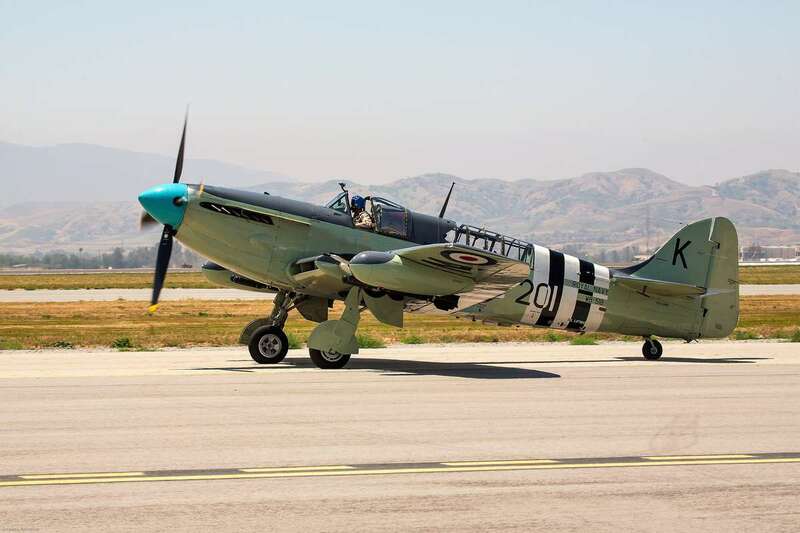 With the disbanding and demise of the RAN Historic Flight, it was returned to the FAA Museum and is on permanent display as of December 2018. Above: WJ109 in its display colours in the Fleet Air Arm Museum in Nowra. Below: WD826 (245/K) was brought to flying status in 1986 on the civil register as VH-NVU. The photo below is at an unknown location, but would have been taken prior to 1989 when engine problems prevented further flights. 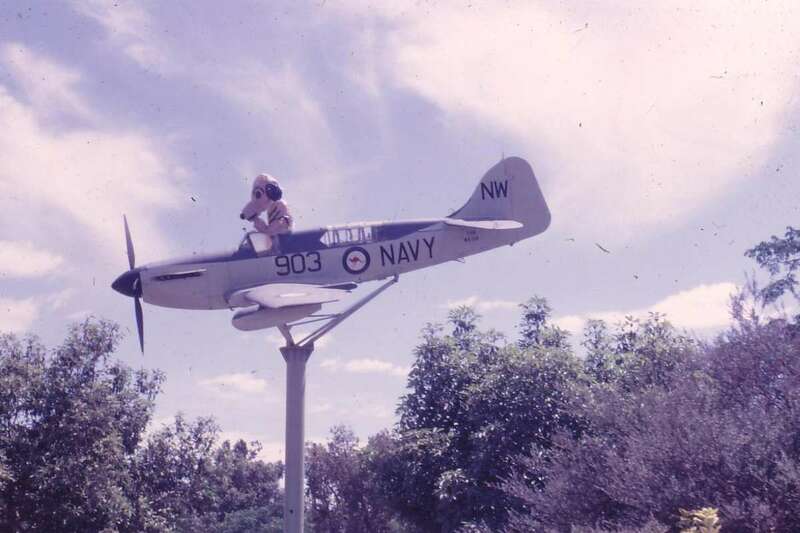 Above: Firefly TT.6 WB518 was issued to the Returned Services League at Griffith, NSW in February 1967 to be mounted on a pole as a memorial. 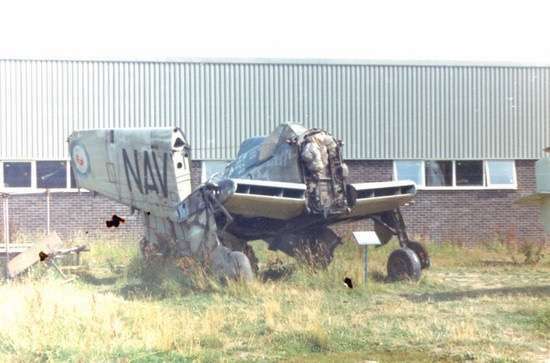 It resides there to this day, although along the way it surrendered some of its components to help another Firefly keep flying (see story below). In the above photograph it is parked in a Griffith trucking yard in July 1967 prior to being hoisted on to the pole. (Image Geoff Goodall). Left: WB518 survived the chopping block, although not in a particularly glamorous way. After operational service it was converted to a Target Tug (TT6) circa 1958 and was operated by Bain & Brown Ltd. In 1966 it was sold to a private collector in Griffith, NSW and mounted on a pole at the Griffith RSL. In 1991 it was brought down and the forward fuselage used to repair damaged Firefly WD828 by the Classic Aviation Company in Bankstown. The forward (damaged) fuselage of 828 was incorporated back into WB518 which was then restored to its pole. Of interest, the repaired WD828 is still flying in the US (see below), but the owner used the markings of WB518 as he considered it a more appropriate serial number. In the photograph left (date and source unknown) some wag has strapped an inflatable Snoopy to the aircraft. Right: WB518 in pristine flying condition, taken in Chino, California. Unofficial reports are this this aircraft was subsequently damaged doing a wheels-up landing, and is under repair. (more text to follow) (Photo: Steward L. Robotham). Read article on the restoration of WB518. WD840 had, like most surviving Fireflies, a chequered history. Disposed of in 1965 (reportedly for AU$640) it was overhauled the following year in Australia before delivery to a private collector in Canada, sans engine, where it was registered as CF-CBH. The owner fitted a bench seat for eight passengers and it was painted in civilian colours. From 1975 onwards it belonged to a series of owners in Massachusetts, Pennsylvania, Florida, Texas and Utah in the United States. 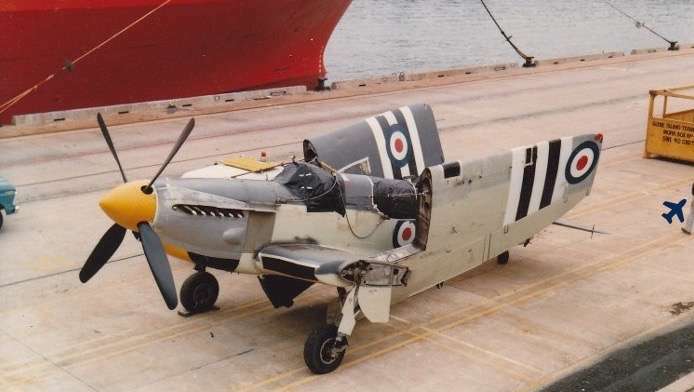 During this period it was slowly being restored to its original Firefly XV configuration. In 2012 Aeroplane Monthly reported that it had been sold to a new owner in Europe, and it was [then] under restoration at QG Aviation in Fort Collins, Colorado. No further updates on this aircraft have been found. Below: WD840 in Canada, converted to carry eight passengers. VX388 was sold to Historic Aircraft Preservation Society in the UK but was never delivered. It was later sold (reportedly for $502) to Mr Harold Thomas, Camden Airport. 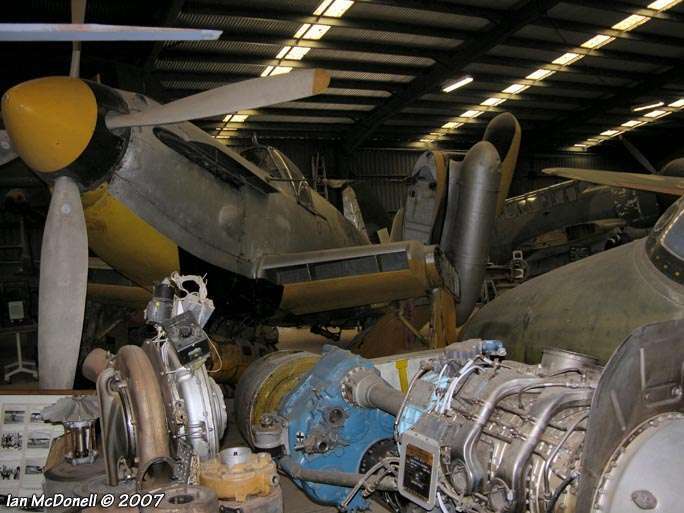 It is currently located at the Camden Museum of Aviation, which is a privately owned collection not open to the public. See below: Photos Ian McDonell (left) and Camden Aviation Museum (right). WD833 has a long history since being sold in 1960, including being reportedly seen at a car wreckers yard in the Melbourne suburb of Northcote in November 1967. (Left top. Photo. Geoff Goodall). Later it was shipped to Scotland, where it rotted in a field from 1975 to 1981. (See Left bottom. Photo: Charles E. Mackay 1979). The aircraft then made its way to the United States, where it was reported in 2010 as being under restoration by Len Parker in Nevada. No further updates to its status can be found at this time. 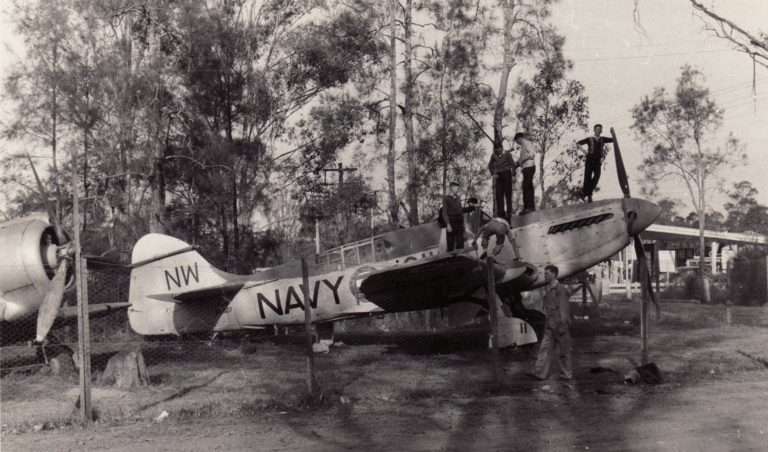 WD827 1956 sold to the Australian Air League, Blacktown, NSW. 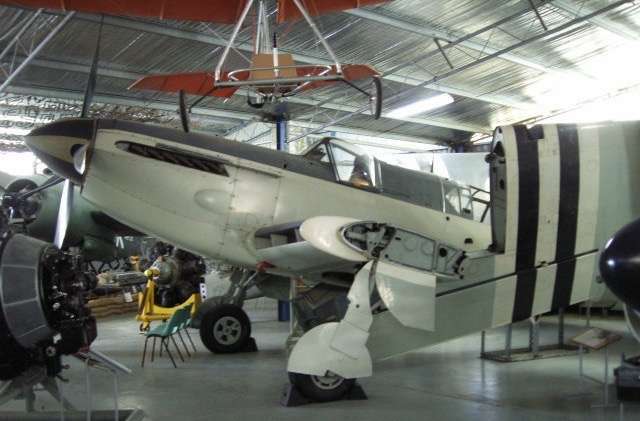 1973 transferred to the Australian National Aviation Museum in Moorabbin, VIC. WH632 1960 sold to the Marrickville Air League, NSW. 1966 transferred to the Camden Museum of Aviation. 1978 sold to the Canadian Warplane Heritage in Ontaria, Canada and restored to flying condition. WJ109 Placed outside gates at HMAS Albatross 1965-1972. Restored by volunteers and preserved as 207K. Currently displayed in the Fleet Air Arm Museum as 238K. 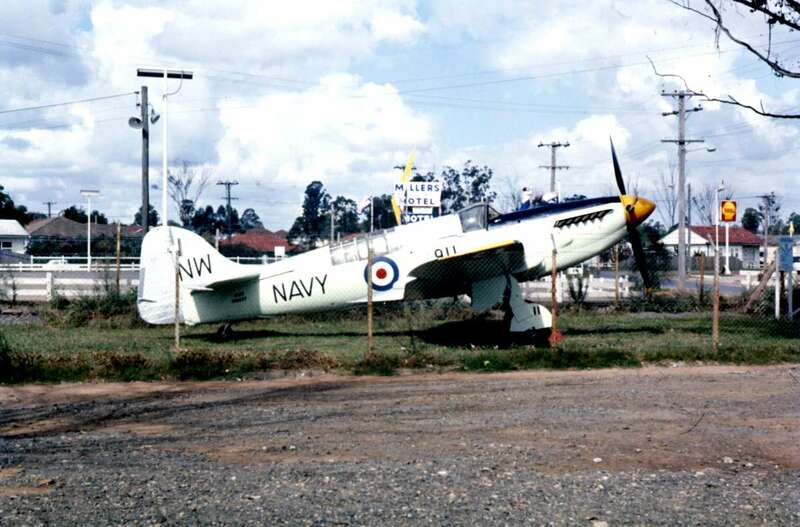 WD826 August 1967 assigned to the Naval Aviation Museum, Nowra (now the Fleet Air Arm Museum). Transferred to RAN Historic Flight in September 1986 and brought to flying status. Withdrawn from use in 1989 with engine problems. WB518 1967 Sold to Moorabbin Air Museum, Vic for $400.00 and preserved. 1973 Sold to Australian Aircraft Restoration Group/Confederate Air Force for restoration to fly at Essendon, Vic. 1990 acquired by Classic Aviation for $100.00 at Bankstown Airport for restoration. Used the forward fuselage and centre section of WB518 from Griffiths, which was then restored to a static display using corresponding parts of WD828. 1994 Partially restored aircraft purchased by Captain Eddie Kurdziel of Fort Collins, Colorado, USA. Restored to flying condition.The It is using serial WB518. WD840 1966 sold to Jarman Aircraft Engine Overhaul Service, Sydney. 1967 sold to Ed Fleming/Skyservice Aviation, Camden NSW. 1969 sold to Bob Deirmert, Carman, Manitoba, Canada for restoration. 1972 first flight after restoration, modified to carry 7/8 passengers. 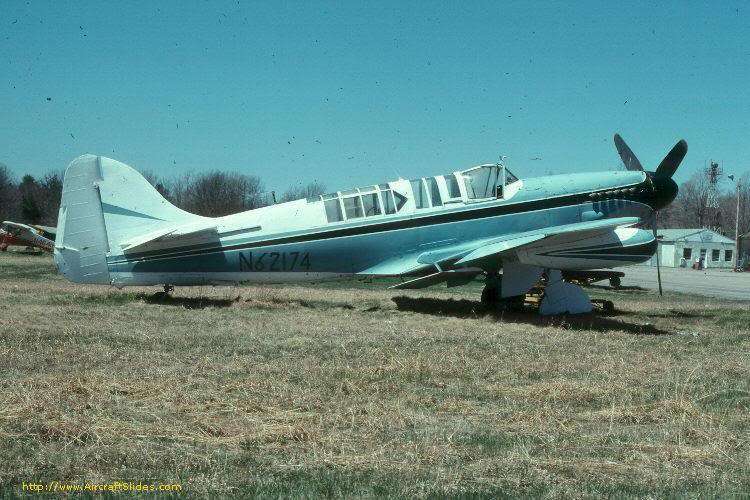 1975 sold to Jerry Barg, South Easton, Massachusetts and re-registered N810J. 1982 re-registered N1840 to Gene Fisher, Mid-Atlantic Air Museum Pennsylvania. 1989 to Don Knapp, DK Precision, Fort Lauderdale, Florida. 1990 to Lone Star Flight Museum, Galveston, Texas. In storage pending restoration. 2003 Airplane Services Inc, Jay, Florida as restoration project. 2006 Andy O’Pry Arm Aviation , Park City, Utah for completion of restoration to fly. WD833 1960 Sold through Dept of Supply to R.H. Grant Trading Co, Hawthorn, Vic. 1973 preserved at Berwick Museum of Transport, Vic. 1975 To Strathallan Collection, Scotland. 1981 sold to N. Grace. 1984 sold to Ward Wilkins Unlimited Aero, Fort Collins Colorado. 1988 sold to Henry J Schroeder, Illinois. Placed on US civil register as N833WD but stored. 1994 sold to Wally Fisk/Amjet Aircraft Corp, St Paul, Anoka Country Minnesota. 2000 to Amjet Services Inc, St Paul, Anoka County Minnesota. 2001 sold to Steve Alex, Rockport, Missouri as restoration project. 2007 reported with Minden Air, Minden Nevada for restoration to fly. 2010 reported being restored by Len Parker at Reno Nevada.